The Great Southern Italy ShakeOut - Get Ready! 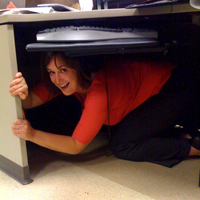 Drop, Cover, and Hold On at 10:17 a.m. on October 17* during Great ShakeOut Earthquake Drills! You can join them today by registering for the 2019 Great Southern Italy ShakeOut. Participating is a great way for your family or organization to be prepared to survive and recover quickly from big earthquakes– wherever you live, work, or travel. Start here to be included in the 2019 ShakeOut!